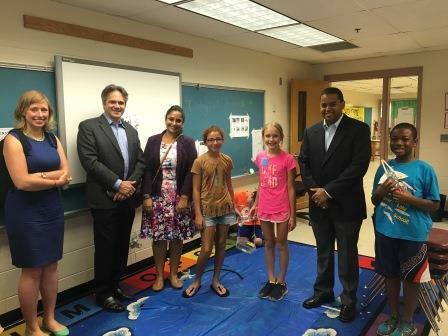 Robert S. Katz, Nigel Fontenot, Shambhavi Patel and Camille Sauer visited elementary school students at Camp Invention at Fort Hunt Elementary in Alexandria, Va., on Aug. 4. Created by the National Inventors Hall of Fame, Camp Invention is a weeklong summer enrichment program that partners with schools nationwide to reinforce the traditional school year with Science, Technology, Engineering and Math (STEM) concepts. Students not only focus on STEM enrichment, but also on entrepreneurship, creativity and innovation, and professional development. Banner & Witcoff’s Pro Bono Committee, chaired by Darrell G. Mottley, supports and works with Camp Invention to teach students about intellectual property and related skills. Nigel Fontenot visit with students at Camp Invention.